A Step by Step tutorial on how to make DIY wall hanging from old clothes.. An excellent idea for reusing your old clothes and adorning your home.. I have variety of old clothes in my closet and most of the time I am not sure what to do with them. While I was searching for how to make paper flowers on the internet I came across this tutorial of how to make roses. Well I thought of giving them a try using old clothes from my closet. And one thing led to another. By the end of the day, I was able to create a DIY wall hanging using my old suits, leggings and a calendar. I loved this wall hanging (especially because I did not have to buy any material for it). The sad part is while I was creating it, I did not click much snaps so I will not be able to depict every step using pictures. Nevertheless, I am trying to capture what I did in words and in case if any step is not clear would love to hear back from you.. Turn around the old calendar such that the blank side of calendar faces you. This calendar will be used as a base on which we will paste our vase and flowers. I used an old calendar as a base as the existing thread at the top could be re-used for hanging my wall hanging. In case if you do not have a calendar available – you can use any thick glossy white sheet or an old poster as a base. And then either get the wall hanging framed or punch a hole at the top and use a thread for hanging it. I had some old printed papers available with me that I have used to create a base. You can either leave the base as white or choose to buy some printed papers from the market. Note that these papers should not be too bright otherwise the vase and flowers that you will paste on it later will look dull. Apply glue on the calendar evenly (if you want you can use a brush for the same) and then paste the printed papers on the calendar. Leave it to dry for some time (approximately 5-10 min). Cut the fabric of your choice into long strips to create a boundary of the wall hanging. I have used an old yellow colored flower printed suit for the purpose. Defining a boundary gives more focus on what you would be pasting inside. Cut strips long enough to cover the length of the calendar. Apply glue on the fabric strips evenly (if you want you can use a brush for the same) and then paste the fabric strips on the calendar to cover the boundaries. Leave it to dry for some time (approximately 15 min). After this step you will have the base for the wall painting ready. Next we will be cutting out a vase and creating fabric roses. I had a piece of brown handmade paper available with me which I used for creating the vase. In case if you do not have that available – you can either buy a sheet or use anything else of your choice as well. for e.g. any other brown paper or fabric or an old jute bag. Now, view the base created in step 3 and imagine it to be divided into two halves – the upper half where you will paste your roses and the lower half where you will paste the vase. The upper half will be smaller in size than the lower half. If you want you can mark the two halves lightly using a pencil and measure the length and breadth of the lower half. Remember this mark is only for you and you will need to erase it later. The measurement of lower half will give you an idea of how big or small you want your vase to be. Then, draw a shape of vase on the selected material and cut it out. The dimensions of the vase will depend on the measurement of lower half of base that we just took. Keep this vase shape ready but do not paste it yet.. Let us first make fabric roses. To create fabric roses you will first need to cut strips of the selected fabric. I had old leggings in pink and red color which I used for creating roses. You can choose any colored fabric of your choice for the purpose. I will suggest to choose fabric of bright and solid colours. 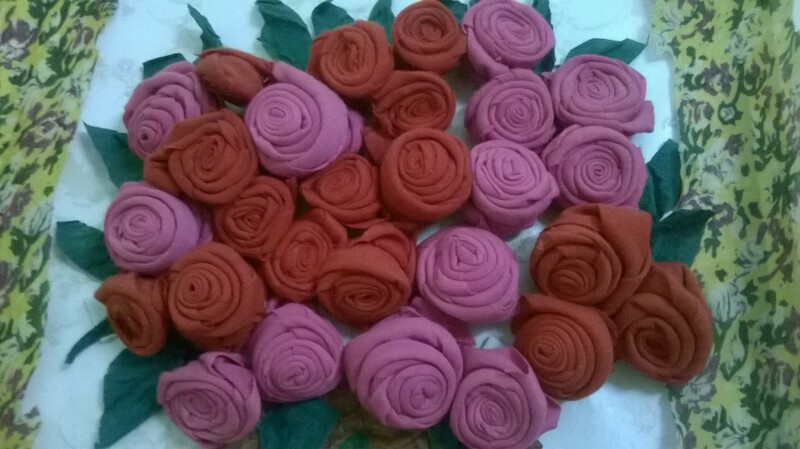 These roses can also be made of paper strips so you are free to choose a material of your choice. Now, you have to cut the material of your choice (in my case leggings) into strips. For the first flower, you can play around with length and width as that affects the size of flower that will be created. One fabric strip will be rolled into one flower each. So once you have created one flower successfully, you can cut out the rest of the strips. Please follow steps in this blog to roll a fabric strip into a beautiful rose. The only difference is that we do not want the stem to be long. So you can paste the fabric strip remaining in the end to form base of the flower. Now, we have the base, the vase and the flowers ready for pasting. Place the vase and the roses on the wall hanging and arrange them. If required make changes in the vase size or number of flowers or placement. Once you are happy with how everything looks, apply glue on the back of the vase and paste it where you want it to be. Again pick up each flower apply glue on its back and paste it where you want it to be placed. Slowly all the flowers and vase will be pasted on the wall hanging. Your wall hanging is now almost complete. To create leaves, I used an old green suit. You can use any green colored fabric or paper for the same. Cut leaf shapes from the fabric and paste them between flowers (that we had already pasted earlier). After my flowers and leaves were ready. I realized that the vase portion of the wall hanging was looking a little bit dull. Since it was a big portion of the wall hanging, I used border or lace from my old suit and used it to decorate the vase. If you want you can use ribbons for the same purpose. After decorating the vase my wall hanging was ready. Sure Karissa. That would be fine Also please share your blog link with me..